Nuts are an ideal foods for the health of the heart muscle, as they are abound with good fats and valuable antioxidants. Therefore, the recommendation of nutritionists are hazelnuts, almonds, walnuts or peanuts to consume at least four times a week so to prevent many cardiovascular ailments. If professionally or recreationally you do sports, think every day what to eat after a workout, nuts are an excellent choice. Nuts are considered very favourable in terms of cardio protective effects. First of all, they have monounsaturated and polyunsaturated fats, which lower LDL, known as bad cholesterol. Partially influence the increase in HDL cholesterol, known as good cholesterol. Most of these nuts contain over 50 to 60 percent of fat, mostly polyunsaturated and monounsaturated. We suggest four to five times a week to consume half a handful of nuts during the day, while reducing the amount of animal fat in the body. So you should significantly reduce the amount of food in the three main meals and calorie intake to supplement with a brunch at least four times a week to consist of two or three tablespoons of mixture of nuts. 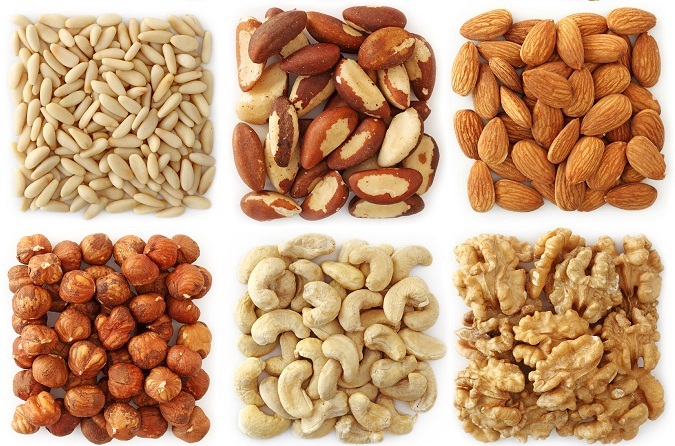 One of the most important antioxidants - vitamin E – is also located in the nuts. Antioxidants are of paramount importance in protecting cells from so-called oxidative stress. In the context of cardiovascular diseases, oxidative processes that occur in the blood vessel walls, in atherosclerotic plaques, can cause rupture with catastrophic consequences. Nuts contain a high percentage of L-arginine, which is responsible for more flexible blood vessels less likely to clot formation. This amino-acid, available in the form of capsules are recommended as adjunctive therapy to relieve the symptoms of angina pectoris and heart failure. How nuts contain a high percentage of fibres that give us a feeling of satiety (a meal of a mixture of almonds, hazelnuts and walnuts can bridge the period between two smaller meals) and are often used with popular diets. Except for losing weight it is especially important in the control of diabetes, where this valuable fibres have additional beneficial effects in reducing postprandial hyperglycaemia, inevitable jumps in blood sugar after a meal. It also reduces the cholesterol. Nuts are one of the best natural sources of omega-3 fatty acid among the foods of non-animal origins. In the story about food and cardiovascular diseases we still need to return to the "Mediterranean diet". Apart from fish and seafood, wine, whole grains, fruits and vegetables, an essential part of this diet are nuts for weight loss. So, eat almonds, walnuts, hazelnuts, cashews, pistachios, pine nuts and peanuts. Try something of the above mentioned and you cannot go wrong. This medicinal salad is relatively easy to make you only need ten minutes. How to make it: finely chopped fruits mix and serve. Pour with a mixture of Greek yogurt and honey. From above sprinkle with nuts, you can also add a teaspoon of honey. Nuts in the salad serve with a glass of fine white wine. This dish is one of the moderate difficulty and it will take about fifteen minutes to make each fish. Cut the trout along its body, add salt and pepper. Flour and milled almonds mix together and roll the trout in it. Fry on minimum oil, in a teflon pan (will not stick), seven to eight minutes on each side. From above sprinkle with toasted almonds, and you can use acacia honey as well. A great combination but not everyone likes salty and sweet at the same time. This dish is also moderate and the preparation time is about 45 minutes. Preparation: Heat the wok. Put the nuts in a dry wok and fry them for five minutes to get a golden colour, until it is crispy and aromatic. Take them out. Pour the sesame oil and fry the chicken on it until golden brown. Put all the other ingredients except the gustine. Fry for a good five minutes. Replace nuts. Pour water from the gustine and allow it to simmer for the next two minutes. Another great recipe in which nuts have significant part. For a complete preparation you will need about twenty minutes. Preparation: chopped fruit mix well and pour it all together with the juice of half a lemon. Serve it over the leaves of lettuce. Then pour the prepared dressing of yogurt, lemon juice, pepper and salt. On everything put a handful of coarse finely powdered roasted nuts. Serve with a light white wine. Enjoy! 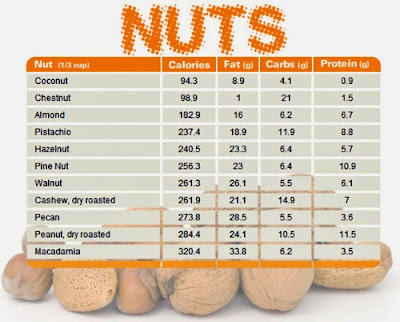 Nuts are very useful for our health, they help with weight loss and are favourite on our menus. We recommend the article cashews.